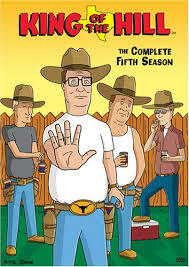 Most of my reviews of King of the Hill seasons point out that while the show was designed to be played in any order, there were a lot of continuous storylines and character arcs that transcend the purely episodic. Season 5 seems to cement that, with lasting developments in the subplot of Nancy Gribble’s affair with John Redcorn, and their son very abruptly and very noticeably growing up and hitting the awkward stage of puberty – while quirky Bobby Hill is left behind. While this season has some of the highlights of the run, with great episodes centred on Hank’s feelings for his dog (and his truck), interesting examinations of attitudes to sexuality in conservative America and Cotton actually showing some humanity by working demeaning jobs to support his new child, there are also some of the biggest misses so far. Cotton’s scheme to assassinate Castro reminded me of when The Simpsons changed Mr. Burns from a cruel, rich boss to a monster who would gleefully murder a child, and was a step or two beyond what King of the Hill ought to be. An episode centred on a prostitute had some very fun moments but was a bit too far-fetched for the tone of the show. The same could be said of when Bobby becomes a ventriloquist. There’s also a bit too much foregrounding of guest voice actors, which gets jarring. But the show remains consistently funny, clever and smart, with Peggy and Luanne increasingly becoming the funniest characters. Dale and Bill get some highlight episodes and the show continues to have fun skewering both leftist and rightist thought.